Environmental groups throughout the Upper Midwest are praising President Bush's proposal to fully fund the Army Corps of Engineers' Mississippi River environmental restoration program. However, some critics are wary of the president's proposal. They say the money is throwing a bone to environmentalists even as the Army Corps makes controversial plans to expand the river's lock and dam system. Rochester, Minn. — The president's request of over $33 million is the most money ever proposed for the program since its inception in 1986. The Upper Mississippi River System Environmental Management Program, or EMP, funds research and habitat protection for over 1200 miles of the river and its adjacent wetlands. Until now, the Bush administration has held back on giving full funding to the program. Just last year, Bush proposed to cut the program's budget in half. The new proposal has surprised many in the environmental movement. "The ramping up of EMP to full funding is a good signal for the environment," says Mark Beorkrem, Program Consultant for the Mississippi River Basin Alliance. He says he's encouraged by the president's proposed budget. But, he says, even more money will be needed. He says the Army Corps' lock and dam system has badly damaged the river's ecosystem. The problem now, Beorkrem says, is for states and environmental groups to find more money to reverse that damage. "We need a forum such as EMP to monitor the environmental situation and conduct the projects to find out how we coexist." "How do we find what is certain to be many more tens of millions of dollars that is going to need to be going to river restoration?" he asks. Beorkrem thinks the president's gesture to fully fund EMP will benefit the Corps' image. However, many are still wary of the Corps' intentions. Dean Rebuffoni is a volunteer for the Sierra Club. Before he retired, he covered environmental issues for the Minneapolis Star Tribune for over two decades. He says the Army Corps of Engineers is heavily influenced by large grain corporations who profit from the river's commercial use. Although many of those businesses lobbied in favor of more funding for the EMP, Rebuffoni says the lobbyists have an ulterior motive. "None of that affects the barge industry, it doesn't hurt them at all," says Rebuffoni. "In fact, by supporting it, they can argue, 'now give us expanded locks and dams on the river.'" "The Corps seems to be run more at the behest of congress than the president at the time, because the Corps can deliver pork to any congressional district in the country." But lobbyists insist the environment is important to them. "Am I looking to appease anybody? No. I think it's the right thing to do," says Lee Nelson, board member of Marc 2000, a lobbying group for commercial interests on the river. Nelson says environmental groups need to remember that commercial traffic on the Mississippi benefits the region's economy as a whole, from farmers who do business with grain companies to cement companies who use the river to transport supplies to build public schools. "We need a forum such as EMP to monitor the environmental situation and conduct the projects to find out how we coexist," says Nelson. The Bush proposal for the Corps' budget also recognizes the controversey surrounding the Upper Mississippi River Navigation Study. The original study showed there was a need to expand the river's lock and dam system. However, it was discredited over two years ago after a Corps Economist accused the agency of skewing its figures to the benefit of the region's commercial interests by making the expansion look good. The Corps has since hired a new consultant for the study: the Sparks company. It's a leading grain commodities forecasting business. This has resulted in criticism from environmental groups. According to the Mississippi River Basin Alliance's Mark Beorkrem, Sparks Company's work will steer the Corps' work towards decisions benefitting business. "They should have some of the knowledge, but they're biased. They want to promote their industry, they want to promote foreign trade, that's how they make their money," says Beorkrem. "The Corps, in its decision process, has to recognize that kind of bias that can creep in." The Project Manager for the Upper Mississippi Navigation study is Denny Lundberg. He recommended the Corps hire the Sparks Company because he thought it was the best candidate for the job. He says the Corps has also hired a three-member independent technical review board to review the Sparks Company's work. The report is expected to be released within the next two weeks. According to the Corps, more than 20% of the president's proposed $4 billion budget for the entire Army Corps of Engineers will be used for environmental work. The proposal also calls for the Corps to make greater efforts to reduce congestion on the river through managing barge traffic. Up to now, the Corps has allowed companies to make their own schedules. 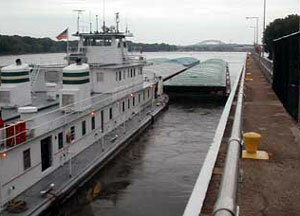 Environmentalists say traffic congestion from barges kick up river sediments which can harm wildlife along the river. The Corps' Lundberg says changing the existing system will be difficult, because traffic is largely driven by the market. "When they think they're going to make money on shipping it, that's when they ship it," says Lundberg. "If a tow comes to a lock, we lock them through. It's as simple as that. We have agreed to re-evaluate that, and as part of our evaluations now, we're looking at that." Lundberg says the Corps has hired consultants to see if better scheduling can improve shipping efficiency. It's selected the Volpe Center, a research arm of the Department of Transportation that has worked on the Panama Canal and the St. Lawrence Seaway. The Bush proposal also asks the Corps to develop a new economic model to carefully weigh the costs and benefits of major new investments like expanded locks. It's an encouraging request for environmental groups who say expanded locks will further damage the river's ecosystem. However, the Sierra Club's Dean Rebuffoni predicts Bush's request may lose steam when it reaches congress. "The Corps seems to be run more at the behest of congress than the president at the time, because the Corps can deliver pork to any congressional district in the country," says Rebuffoni. "Every congressman wants some of that pork. Presidents have tried to stem congress's power before, they haven't. Let's see how much power Bush has?" Before looking at Bush's current proposal, congress still needs to vote on the Corps' budget for this fiscal year. Currently, the proposal is being debated in a Senate conference committee.